Clicker Heroes started life as a flash game in a world where Cow Clicker (Wikipedia) took on the Freemium games industry (and some would say won). 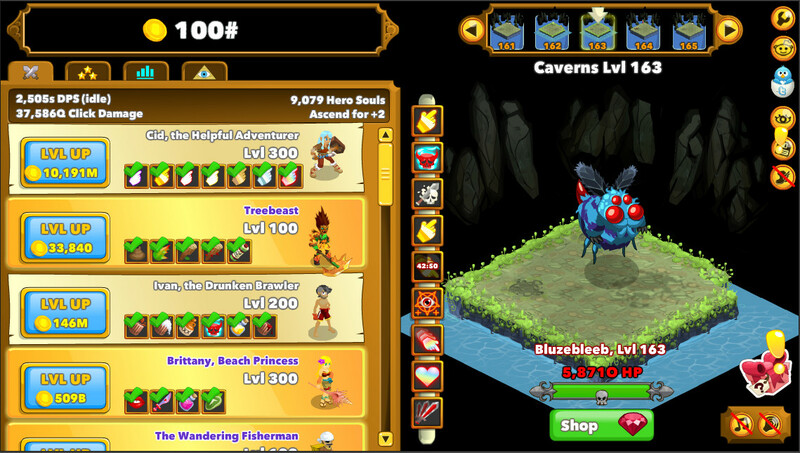 Clicker Heroes took a “game” intended to satirize and poke fun at Social Game mechanics and… made a game out of it. Sure, they weren’t the first nor the only, but with player numbers as ridiculous as the DPS you’ll be doing in-game it’s hard to argue that it’s one of the most popular. And now the iOS version is coming, after being on Steam for two months and Android for something similar. It’s soft-launching in Canada, which means that if you’re elsewhere in the world you’re out of luck for now but rest assured, you’ll be able to smosh those beasties soon enough. Check out our game hub for links to all the different versions of the game and other general info. The game WILL take your life over for a short while though… You’ve been warned.